Dug in around LVT(A)-4 and LVT-4 Amtracs, African-American and white United States Seabees of the shore party rest after working as stevedores, medical orderlies and stretcher bearers, probably on D-Day. The shore party was to follow assault troops ashore to handle food and ammunition, as it was brought to the beach. A solid three inch orange circle, painted on their green dungarees and helmet, was the shore-party insignia and contrasted to the diamond in a rectangle painted on the dungarees of others in the leading assault wave. Two men, one with a glass bottle of blood plasma, attend a wounded man who is lying in their foxhole. 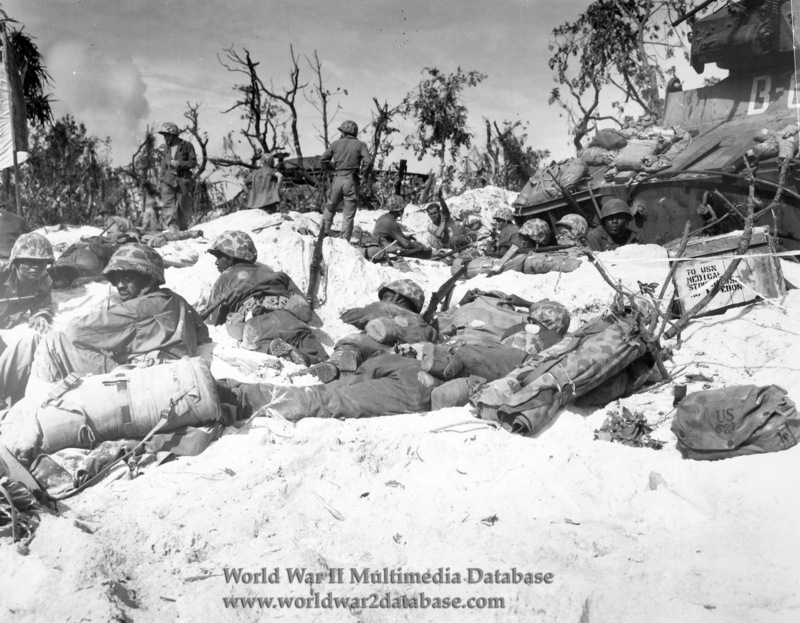 Others try to rest in the 115-plus degree heat of Peleliu. They are armed with M1903 Springfield rifles and M1 Carbines. These black Seabees, assigned to the 17th Special Naval Construction Battalion, constantly volunteered for hazardous duty such as bringing in the wounded. This group landed at H-Hour-plus-two and worked until they were exhausted; so tired they slept through artillery barrages. 5.3% of the Navy's personnel were African-American, despite repeated attempts by United States President Franklin D. Roosevelt, the Bureau of Selective Service and its parent organization, the War Manpower Commission to increase their numbers. 164,942 African-Americans served in the United States Navy during World War II. Most were rated as mess attendants, cooks, or other food preparation ratings; thirty-nine segregated "special" Construction Battalions (CBs, or Seabees) moved cargo from ship to shore. In 1943, only 7,000 of 38,000 African-Americans in the Navy were Seabees.